It is no secret that life can be hectic. Deadlines, emails, phone calls...all of it makes that proverbial “hamster wheel” feel more real than ever. The minute we step out from our doors we are swept away by a flood of “to do’s”. When my wife and I were young we lived in New York. At that time I was early in my culinary career and, for lack of a better term, “dirt poor”. Being a budding foodie and chef in New York is both a blessing and a curse. On the one hand I was living in an epicurean paradise. On the other hand, many places were beyond my budget. From the time it came into being we knew Big Shoulders Coffee needed to be different. The values that we built Big Shoulders on had to be more than words on a page. They needed to be the heart of what we do and a visible expression of who we are. For this reason, we were determined to build not just a company, but a culture. When I meet customers for the first time, one of the questions I get asked the most is “Why did I start Big Shoulders Coffee?”. People who know me well know that I hate talking about myself. They also know that I am insatiably curious and appreciate that quality in others. So for all of the curious in the world, here is the story of how Big Shoulders Coffee came to be. This past weekend, Labor Day, I was able to get away with my lovely family to a small lake in Indiana. It was a slice. Typically I brew my wife a Chemex every morning. I have the basic tools to make a really great cup of coffee...a gram scale, a temperature-controlled kettle (203 degrees), a burr grinder, Chemex carafe and bonded filters. It doesn't take long or much effort to do this in the morning. Anyway, this particular trip I decided we would "rough it" and I'd leave all that at home. When I woke up in our little cottage, I saw a kind of Mr. Coffee knock-off on the counter, but couldn't find filters. I had to McGuyver a filter out of paper towels, eyeball the amount of grounds for brewing and used the tap (well-water). The result was really bad coffee. When I took it to my wife, relaxing on the dock, she literally spit it out, asking what is that??! When I confessed it was our coffee, a coffee we had enjoyed at home the previous morning, she wouldn't believe it. I tell you this, because it underscores the fact that no matter how much we put thoughtful action into our work, and how good we think the results are, the end consumer has the upper hand and final say so. And, if they are brewing it like I did, there is nothing we can do to influence the outcome. My mind has been dwelling alot on Fair Trade and Social Justice concerns how can coffee contribute and specifically how can Big Shoulders contribute? We almost always forget about the work that went into the coffee before we get our hands on it, while we're focusing on what we do; customer service, thoughtful drinks, keeping the place clean, stocked and organized. Coffee, like all farming is labor intensive. Almost all of this difficult work is by human hands. Some of these farm workers are most certainly vulnerable to poor work conditions, low wages, discrimination. Indeed, labor probably constitutes 60-70% of that cup of coffee you're enjoying...how do we make it more equitable while responding to quality expectations? How do we do it without making people feel guilty, should we feel guilty? Where do our grounds go? Pick up plant starters for your home garden at the Urban Farm Plant Sale! Plants for sale will include lettuce, kale, Swiss chard, onions, tomatoes, peppers, eggplant, basil, parsley, cucumbers, squash, zucchini, melons, cabbage, broccoli, zinnias, nasturtiums, and more. Support a local organization, and start your garden with healthy plants grown in our state-of-the-art greenhouse! Cash, check, and credit cards are accepted. 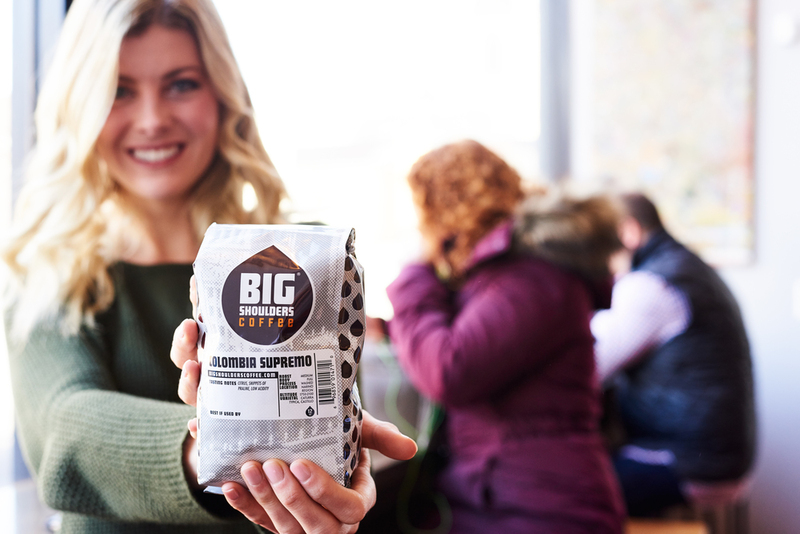 Big Shoulders Colombia: Supremo Coffee AND a Supremo Value. We were delighted last month when Coffee Review called Big Shoulders Colombia Supremo one of the nation's top "everyday" coffees. Obviously we're in complete agreement. Packed with chocolate, fruit and nut notes and pleasantly tart, it's hard to beat as a go-to coffee on a Monday morning. We were also very gratified that the good folks at Coffee Review also noted its exceptional value. At $10.75 per bag it's noticeably below the price of other "everyday" coffees in its class. Great taste, great price, what's not to love? Thanks Coffee Review, we love you! We are very excited to announce that Big Shoulders Panama Esmeralda Geisha — the coffee that set the coffee loving world on fire last year, garnered a 96 rating from Coffee Review, and #13 ranking on their list of Top 30 coffees for the 2015 — is back. This year it came in with a 95-point score...still very highly rated! The beans are in, they're roasting to order, and the coffee is being poured as we speak. Well, at least I'm enjoying a Chemex right now. So come and get it while it's hot. Because when it's gone, it's gone, and we never know if and/or when we'll get it back again. We were super lucky to get two bags this year. Who notices something different about us? Anyone? Anyone? Yes, you in the back with the double shot latte. That's correct — we've got a brand new website! We completed it just this week in partnership with our design and marketing partner, Nerve Collective, and we hope you like it every bit as much as we do. What's new? Well in addition to the new look we've got more information on current coffee offerings, which we'll continue to update as new beans come in. We also have a revamped online store that will make ordering easier and which (on our end) will make packing and shipping orders a faster process. And of course we also have a blog now, so check back often to see the latest goings-on here at Big Shoulders Coffee. Now that it’s even easier to contact us, we hope you won’t hesitate to comment or email with any of your thoughts or suggestions on how we can improve your experience — either online or in our store. More from us soon!